Egyptian media chose to spin the occasion as a rescue operation. HornAffairs’ sources elaborated that the government had already paid for a special Ethiopian Airlines flight to travel them to Cairo yesterday evening. However, Egyptian officials, who are informed of the repatriation plan, somehow chose to send a military plane to pick the returnees around noon and have them received by Al-Sisi. 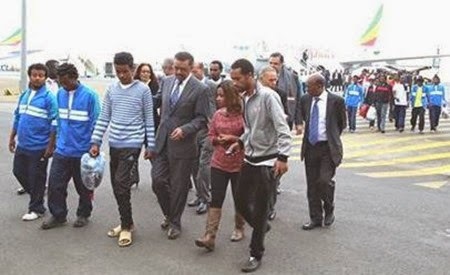 It came as a surprise to officials Addis Ababa who planned to have a senior official receive them in Cairo. The situation further disturbed reception plans in Addis Ababa as the timetable was changed by about eight hours. The unnamed source further said to horn affairs correspondent Egyptian army merely provided transportation, on its own initiative, and all those repatriates from Libya, are in the government controlled area . “The Egyptians were helpful, as were the Sudanese and Libya diplomats. We don’t wish to claim exclusive credit for everything.” Adding that, “there was no rescue operation; the returnees were in a government controlled area”. Said the official The repatriates who were transited through Cairo airport yesterday received a warm welcome by President Al-Sisi. Egyptian media chose to spin the occasion as a rescue operation..
A source in the Ethiopian government, however, told HornAffairs, “there was no rescue operation; the returnees were in a government controlled area “.